Home » October Unprocessed Posts » Food For Thought » OMG…GMO! TMI? WTF!? I was standing with my clipboard at the farmers market when she walked by. “Would you like to sign an initiative to get labeling for genetically modified food on the California ballot in November?” I said. “Don’t you want to know what’s in your food?” I asked. I paused, in holy crap mode. “But what if I want to know?” I said. “They tell us too much already,” she announced. I could see her reasoning-impaired mind was made up, and like they told us in signature-gathering training, when someone is not going to budge, just move on. So like a good volunteer, I let her go. We don’t need to know everything? Sheesh, lady, since when is a measly sentence fragment that says either “Genetically engineered” or “May be partially produced with genetic engineering” everything? It’s a few syllables and a splash of ink. They have to print the labels anyway. It’s not like I’m asking these food companies to give up their precious high-fructose corn syrup or anything. What about the labeling of tree nuts? People who go into anaphylactic shock from peanuts don’t need to know everything? Lady, do you even know what a GMO is? A Genetically Modified Organism is when a crop’s DNA is artificially manipulated by inserting genes from other plants, animals, viruses or bacteria into it so it can withstand large doses of pesticides and herbicides. These gene sequences don’t occur in nature, and GMO crops have never been proven safe to eat. Did you know that GMO corn is engineered to produce its own pesticide—so if a bug bites it, its stomach will explode and die? Lady, if you want to eat bug-busting bacteria bathed in toxins, knock yourself out. But let me pick my own poison. Lady, did you know that all these pesticides are polluting our food, water and air, and the FDA has never even done any long-term safety testing on these experimental crops? Well, the very first peer-reviewed, long-term animal study just came out linking GMO corn to mammary tumors, kidney and liver damage and other serious illnesses. Monsanto, the largest maker of GMO seeds and pesticides, also made Agent Orange, DDT—and for years, covered up the dangers of PCBs—another one of their greatest hits. So why should we entrust our health and planet to these poison profiteers who are raking in billions? How can we track the health effects of all the GMO soy, corn and canola we’re eating if we don’t know we’re eating it? Don’t you think they owe it to us guinea pigs to tell us we’re being used as subjects? Hello? Am I still in America or did I accidentally stray into Corruptistan? Lady, if you can see Russia from your house like some people, squint real hard and you’ll see that they’ve got GMO labeling on their food. China too. In fact, nearly 50 countries demand it. American companies like Coke, Pepsi, Nestle and Kellogg are required to label genetically engineered food in all of those countries, but nope, not here in the good ole U.S. of A. What are they trying to hide? Are they banking on all of us being just like you? Well guess what, lady. It turns out about 90% of us aren’t like you. We’re nothing like you. We want to know what’s in our food! Yes, lady, the alarm has sounded, and it’s called Prop 37 – the California Right to Know Genetically Engineered Food Act. Is it any surprise that those same American corporations have poured millions of dollars into defeating it? But that won’t stop us because this is about ordinary Americans standing up to the biotech and pesticide industry and asserting our basic rights as citizens and consumers. 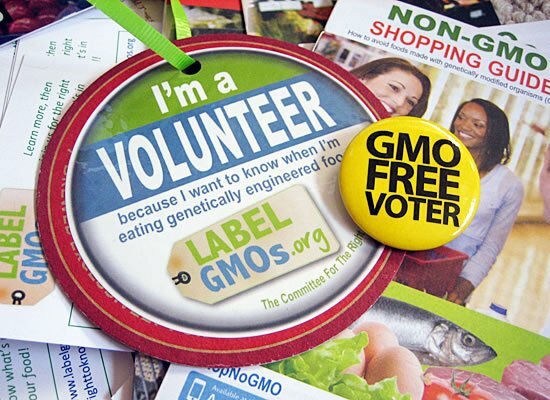 And since the FDA doesn’t require GMO labeling, it’s time for someone else to come along and get the job done this November. Because whether you’re a Democrat, Republican, Independent, Libertarian, Tea Partier, Green or Whig, we have a right to know what’s in our food. So thanks, FDA and USDA, but California can take it from here. Lady, it was nice chatting at you. And don’t forget to vote Yes on Prop 37! Adair Seldon is a humorist and clean-food advocate who has parlayed two of her greatest pastimes, overthinking and overeating, into the blog, Lentil Breakdown. She is also an award-winning advertising copywriter and creative who works with major brands at her company Copy Farm. 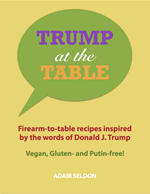 Adair is the author of Trump at the Table, a hilarious eCookbook that features healthy recipes based on Donald Trump quotes (16 tasteless remarks, 16 tasty recipes). You can follow Adair on Facebook, Twitter, and Instagram. I don’t live in California, (though I once did), but I have promoted Yes on 37 on my blog. California is the theoretical “older sibling” in this issue — it is stretching the boundaries which should enable all the other states to more easily put this type of legislation in place. I wanted to point out that in Washington State, we have a similar ballot measure this year called Initiative-522. I-522 aims to achieve many of the same standards (if not better) than what is proposed in California. This measure is not really getting much press, even in Washington State, but it is important for folks to know about! Thanks for your guest post! Thanks, Angela, for the WA state info on I522. I’ve not heard a word about it, other than from you. I will look for that when I vote. Well, if nobody’s heard anything about it, that means AgBiz isn’t overspending to defeat it . . . so maybe, just maybe, it stands a chance of passing under the radar, even if 37 doesn’t. Because, *sigh*, I’m in Texas and can’t vote on either one. Chris, from what I know about the writing of the bill, it went through sundry lawyers and revisions and had to be somewhat of a compromise. If it were what we all wanted, it would have been too extreme to pass. While I agree, it’s not the perfect piece of legislation, it’s a first step and can be refined later. It’s better to pass this one now. There’s too much at stake and no time to lose! Ha, I knew from the title exactly who wrote this post! Great job Adair. Insightful and funny at once.